COSHOCTON- Violet (Knox) Helmick Durben, 88, died Monday, January 28, 2019 at the Coshocton Regional Medical Center. She was born April 23, 1930 in Martinsburg to the late Chas Leroy and Pearl Vera (Mercer) Knox. She was as member of the Nazarene Church Coshocton, where she sang in the choir, coordinated funeral dinners for many years, and loved to serve during Easter musicals. She sang with the “Voice of the Hills Trio” and also the “Grace Trio” for several years. Violet also enjoyed the Red Cross Lenten services. She spent many hours writing to all her pen-pals throughout the country. However, one thing she loved most was visiting with her friends and family. She was never too busy for a kind word or to stop and chat with anyone. As for her baking…if you knew Violet then you knew she would be sending something freshly baked with you on your way. Her hands were always going on a project, whether it was knitting, needlepoint, sewing, or quilting. 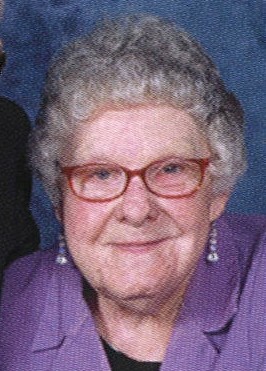 She is survived by three children, Danny (Mary) Helmick, Gary (Teri) Helmick, and Connie Harvey (Don); six grandchildren; ten great-grandchildren; three great-great-grandchildren; two brothers, Ernie Knox and Franklin Knox; a sister, Bonnie (Berry) Schenck; three step-sons, David (Connie) Durben, Danny (Penny) Durben, and Roger Durben; special friends Bob & Cindy Dalzell; and many nieces & nephews. In addition to her parents, she was preceded in death by her first husband, Glenn Helmick; her second husband, Harold Durben; and three sisters. Memorial donations may be made to the Nazarene Church, 1058 Orange St. Coshocton, OH 43812; or to New Life Ministries, 727 S. 7th St. Coshocton, OH 43812.